Originally was an ingenio named Santa Barbara established ca. 1828 near the Hacienda Santa Ana . It was converted to a Central sugar factory in 1894 by A. Masson & Son when it appears the name was changed to Unión. It was a small factory; its first grinding season in 1892 produced only 250 sacks of sugar, increasing to approximately 600 sacks by 1902. 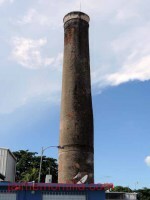 The remains, a brick staircase and the smoke stack, are identified to be from the Ingenio Santa Barbara days by Jorge David Capiello Ortiz in his Biografia de las Riquezas de Puerto Rico webpage. The chimney is identified as one of the oldest chimneys on the island, dating before 1828. The Interamerican University website Centrales Azucareras de Puerto Rico (1873-2007) identifies Union as an ingenio, not as a Central sugar mill which isan error. The smoke stack is reported as being that of Hacienda Union in some places and that of Hacienda Santa Barbara in others. Likewise, Unión is sometimes reported as a hacienda and sometimes as a Central Sugar factory. Production for the 1903 season was expected to increase as that year its sugarcane was supplied not only from its own 75 acres of land but also from lands leased from Hacienda Santa Ana which sugar factory had closed and was abandoned .